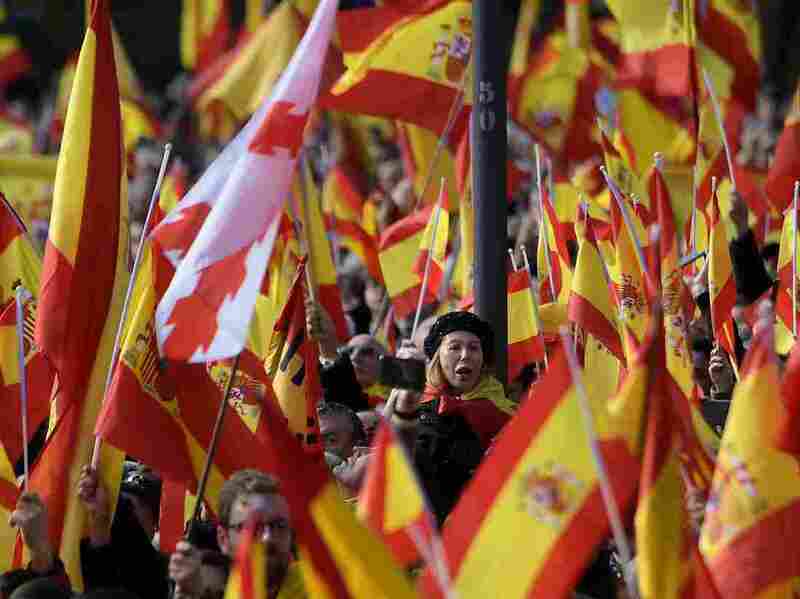 Anti-Immigrant Party Breaks Socialist Stronghold In Spain The Vox Party had remained on the fringes since its founding four years ago but on Sunday, its right-wing anti-immigration platform lead to a 12-seat victory that could shift the balance of power. People hold Spanish flags during a demonstration called by the far-right Vox Party, over the weekend in Madrid. On Sunday, the once-derided party claimed 12 seats Andalusia's regional elections. Spain's right-wing anti-Muslim party claimed a dozen seats in one of the country's regional parliaments in elections Sunday — outpacing expectations in what is being described as a major blow to the new socialist prime minister. Political polls had predicted Vox might win as many as five seats in the southern region of Andalusia. However, as of Sunday night, with 99 percent of votes counted, the once-derided party had snagged more than twice that number — 12 seats in the 109-member parliament, The Associated Press reported. "Now is the moment to say loud and clear who we are and that we have come to stay," Vox candidate Francisco Serrano told a crowd of supporters who chanted "Spain! Spain! Spain!" "We put on the table the need to control our borders and end illegal immigration, end abusive levels of taxation and the need to put an end to ideological laws relating to gender," said the party's secretary general, Javier Ortega, according to The Telegraph. The party opposes Catalan independence and abortion. It favors harsher penalties for ETA, the violent Basque separatist movement, rolling back domestic violence laws, reducing or eliminating taxes and more centralized power. Critics call it a throwback to values espoused by the country's former dictator, Francisco Franco. Spain's southern coast is where many Arab and African migrants land when they journey by boat across the Mediterranean to Europe. As NPR reported in September, "Spain is now receiving twice as many migrants as Greece and six times as many as Italy." The region — the most populous of the country — also has high unemployment rates. The emergence of Vox means the PSOE Socialist Party has lost its grip on power throughout Andalusia, where it had dominated since 1982. And it could mean the party might lose its grip at the national level as well. Although Socialists took a majority of seats in Sunday's election, overall support for the party plummeted to 33 seats from 47 — falling far short of the 55 seats needed to take control of the chamber. As a result, Prime Minister Pedro Sanchez's government remains extremely vulnerable even if it aligns itself with the left's Forward Andalusia, which picked up only 17 seats and includes Podemos. Meanwhile, Vox could help establish a majority conservative coalition with the Popular Party (PP), which also lost ground in the election, and the center-right Citizens (Ciudadanos), which gained seats on Sunday. "Despite winning the election it is a sad night for the Socialist Party," Socialist regional leader Susana Diaz said. "There has been a real loss of ground for the Left. But the worst thing is that the extreme right, a phenomenon that has appeared in the rest of Europe, has arrived here." "Each party must decide if they are against the extreme right or if they will rely on their support to enter into government. I call on all the other political parties who consider themselves defenders of our democratic constitution to break the extreme right," she said. As NPR's Lauren Frayer reported, Vox was on the fringes for most Spaniards since it was founded four years ago. And, as recently as March 2017, Spanish social scientists argued that the nativist party was unlikely to gain a foothold in the country, even as similar political movements had taken root across much of the continent. The BBC reports nationalist movements — fueled by anger toward political elites and mistrust of immigration — make up more than 20 percent of the electorate in Denmark, Switzerland and Austria. Hungary, Finland, Sweden and Italy are not far behind. Meanwhile, an increasing number of voters in France, the Netherlands, Germany, the Czech Republic, Greece, Bulgaria, Slovakia and Cyprus are also embracing populist candidates and ideologies.